(Francisco Kjolseth | Tribune file photo) Salt Lake City Mayor Jackie Biskupski reviews the accomplishments of the City's housing plan, GrowingSLC. With more than a year to go, a new poll has found Biskupski may be vulnerable if she seeks re-election in 2019. 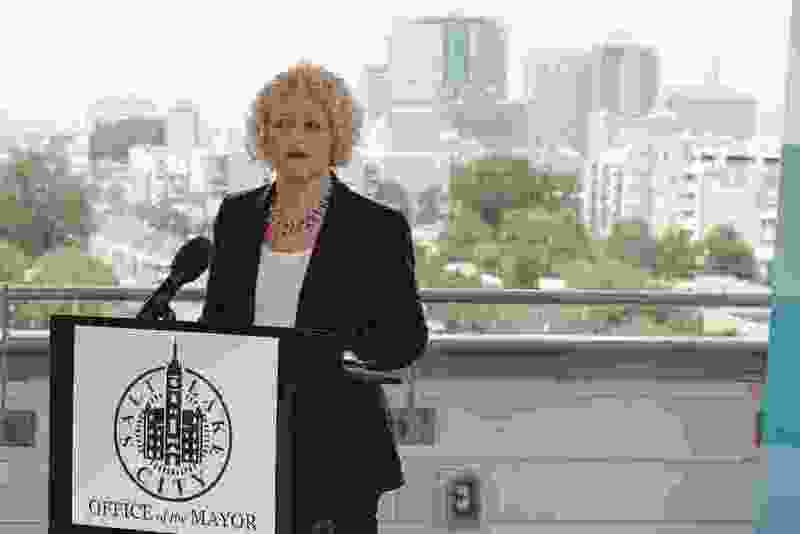 Salt Lake City Mayor Jackie Biskupski may be vulnerable if she seeks re-election in 2019, according to a new poll. A spokesman for the mayor’s office did not immediately respond to a request for comment on the poll. The survey of 203 likely Salt Lake City voters asked whether Biskupski should be elected to another four-year term or if it’s “time to give someone new a chance to serve.” But most people aren’t even thinking about mayoral races yet, Burbank said, and noted the survey’s small sample size. The poll, which was conducted by Dan Jones & Associates from Aug. 22 to Sept. 12, has a margin of error of plus or minus 6.8 percent. Biskupski fares better with Democrats — the political powerhouse in the liberal capital city — than she does Republicans and independents. Some 47 percent of Democrats favor her re-election, while 43 percent prefer someone else. Among Republicans, 78 percent oppose a second term, and 61 percent of independents say it’s time for a new face. The poll found she has good support among younger voters, with 67 percent between the ages of 18 and 24 believing she should receive another term. “What this largely says, I think, is that there is some uneasiness among potential voters about the job that Mayor Biskupski has been doing in the sense that what she would obviously like to see is that, you know, 80 percent of people think she should get another term,” Burbank said. Biskupski in 2015 became the first openly-gay mayor elected in a major city in Utah’s history. Since then, she came under fire for purging city staff when she took office, has clashed with the county and the City Council over the homeless shelter site selection, and, most recently, declined to take part in negotiations on the controversial Inland Port. Burbank said that latest controversy may be playing out in this poll. On the other hand, Biskupski has led the city’s ongoing reconstruction of the airport of the Salt Lake City International Airport, created a department of economic development and implemented policies aimed at expanding affordable housing, making the city greener and ensuring people are treated fairly. She received a civil rights award in May from the International Imperial Court Council for her work to make the city the second in the country to name a portion of a street — 900 South — after San Francisco leader and gay pioneer Harvey Milk. As the election draws closer, Burbank said those accomplishments may change voters' calculations. “She’ll have the advantage of being an incumbent," he said. “She’ll have the advantage of being able to say, ‘Here are the things I’ve done’ and be in campaign mode." While the UtahPolicy.com poll did not float a candidate to oppose Biskupski, one paid for by supporters of state Sen. Jim Dabakis and conducted by Lighthouse Research earlier this year did — and also found the mayor may be vulnerable. That poll showed Dabakis with 26 percent support in a five-way race with Biskupski and other possible challengers. The mayor was at 21 percent, Salt Lake County Councilwoman Jenny Wilson (who is currently running against Mitt Romney for Sen. Orrin Hatch’s seat) was at 19 percent, state Sen. Luz Escamilla was at 7 percent, and former City Council Chairman Stan Penfold got 4 percent. Until Biskupski has some actual challengers, Burbank said the most recent poll numbers shouldn’t be viewed as definitive.